Acurite 10104M Pro Review 2019 – Do NOT Buy Before Reading This! The weather is always unpredictable. No matter how many weather forecasts there are, natural calamities due to bad weather still happen. In fact, the number of weather related calamities is steadily increasing due to the imbalance caused in the environment owing to high pollution and deforestation. In remote and sensitive areas, predicting the weather is tricky and is vital because you should be able take the necessary steps to safeguard your friends, family, and yourself from calamities. When it comes to Weather Station, AcuRite brand always amuses me. AcuRite always comes up with innovative products at afforable price. Recently AcuRite announced a new product, 01024M compact. 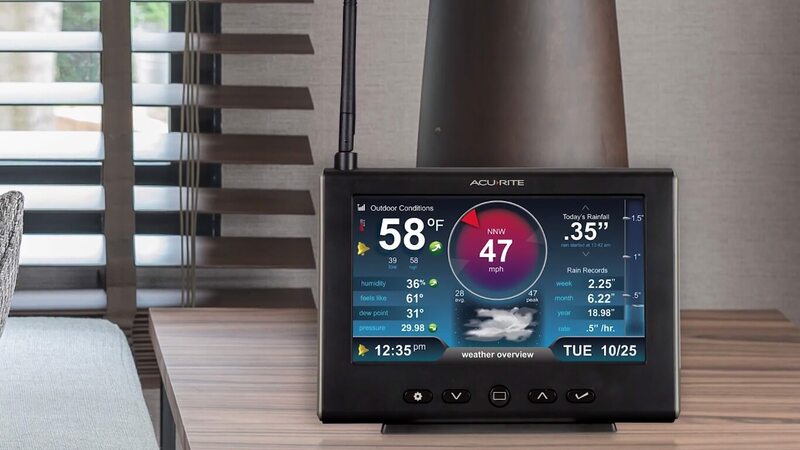 The AcuRite 01024M is a compact weather station that you can fit in your home or office that is equipped with an HD Display to accurately show weather stats like Temperature, Humidity, etc. Weather data displayed by the device includes Temperature, Humidity, Wind Speed, Wind Direction, Rainfall, and Lightning. Apart from predicting the weather, the AcuRite 01024M also displays indoor comfort and conditions of your home that will help you to maintain the right temperature and humidity levels deemed comfortable for your family. This Weather Station will give you a daily, accurate account of both your indoor and outdoor conditions. You can set separate alarms for Temperature, Humidity, Wind Speed, Rainfall changes, etc. It also records and stores Hourly Trend Graphs of Wind Speeds and Calendar records of Temperature, Humidity, Rainfall, etc. You can access them through the display console or through wunderground (You’ve to set it up). There is also a Sleep Mode where the display screen dims and still displays all the weather information. The device features two solar panels. These solar panels provide power to an aspirating fan which maximizes ambient temperature accuracy for the entire day. 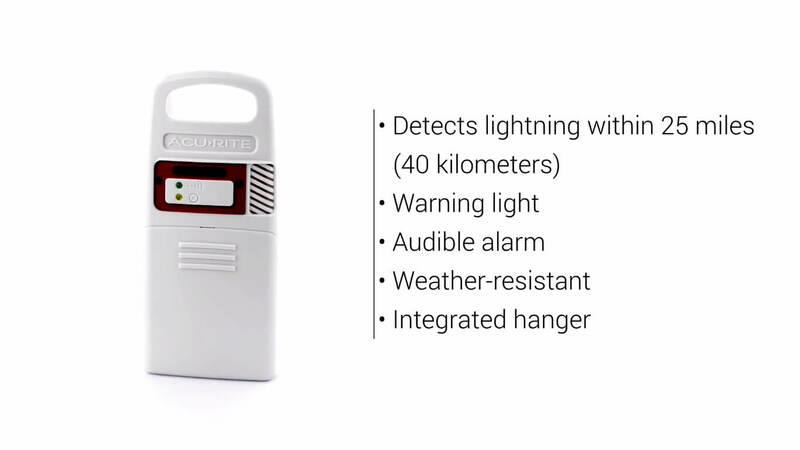 AcuRite have introduced this new feature in this model, Lightning detector. The device is equipped with an advanced lightning sensor that will sense and alert you during lightning strikes that occur within 25 miles (40km) of your location. Whenever a lightning occurs it will beep and light will be flashing in the sensor. You can mount the sensor almost anywhere in your backyard. Daily weather overview gives you a complete picture of the weather conditions. Information such as ‘Feels Like’, ‘Dew Point Calculations’, and Rainfall Collection calculated and displayed by the onscreen Rainfall gauge gives you an in-depth insight into present weather conditions. Read: How To Chose Lightning Detector? The AcuRite 01024M Pro also has a digital clock that updates itself to Daylight Savings. The HD display screen is bright and easily readable from a distance of 20 feet. Outdoor Temperature and Humidity are updated once every 36 seconds. Amazing HD Colour Display for accurate and easy readings. High Quality, advanced device loaded with great features. The 3-in-1 Lightning Sensor displays lighting strikes, temperature, and humidity. The AcuRite 01024M works on 4 AA batteries that will last for 2 years. The station console can be either wall mounted or placed on a table top. The device is durable and can withstand all weather conditions. The base unit of the AcuRite 01024M needs to be plugged in always. Batteries are not available with the unit. Users reported problems with the Rain Gauge. The Lightning Detector shows the data only on the Base Station and does not sync this data on the Mobile App. 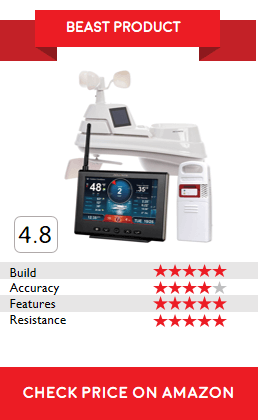 Overall, the AcuRite 01024M is an advanced device at affordable price. It is best used for Professional Weather Forecasting but is also very useful for Personal use. This is one among the cheapest weather stations you can ever purchase. 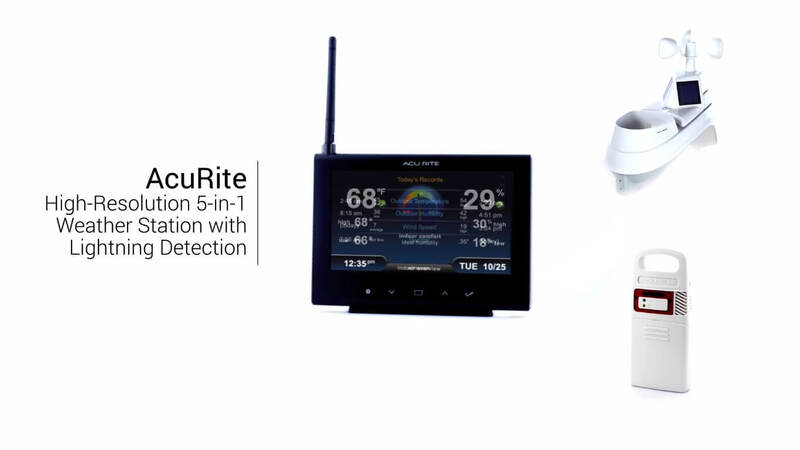 Every AcuRite Weather Station comes with new and improved features and the 01024M does not disappoint. It is highly accurate in terms of weather reporting and has a wide data range that can withstand and report the most extreme weather conditions. For an affordable price, you get detailed weather reporting right where you are.